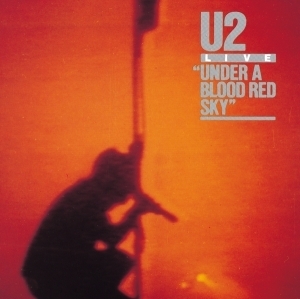 Under a Blood Red Sky album was originally released in November 1983, and consists of live recordings from three shows on the band's War Tour through Europe and America. The remastered edition was released in September 2008 at the same time as the DVD release of the 'Live At Red Rocks' concert video, recorded at the Red Rocks Amphitheatre in Colorado on 5th June 1983. The DVD included 5 previously unreleased songs, a director's commentary, digitally re-graded pictures and a 5.1 mix. Tracklisting as follows: Out Of Control / Twilight / An Cat Dubh/Into The Heart / Surrender / Two Hearts Beat As One / Seconds / Sunday Bloody Sunday / Cry/The Electric Co. / October / New Year's Day / I Threw A Brick Through A Window / A Day Without Me / Gloria / Party Girl / 11 O'Clock Tick Tock / I Will Follow / "40" Alongside single disc formats of the CD and DVD and an LP version of Under a Blood Red Sky pressed on 180gm virgin vinyl, a deluxe version of the remastered Under a Blood Red Sky featured both CD and DVD. I was watching TV in 1985 and "Live at Red Rocks" came on. I was blown away by the bands sound. I went out, bought the cassette and U2 has been my #1 rock group since. "Live is where we live." It's been said by each member of the band at one point, but here is the earliest evidence -- U2's first live EP, released at the tail end of 1983 on the heels of the successful War tour, proved that U2 was a force to be reckoned with. Larry's thundering drums echo through "Gloria," the fiery opening track, all but daring the audience to ignore the band. Each member of the band has their moment to shine (including, yes, Edge's famous screw-up during "Party Girl", leading to Bono's playful "Guitar hero!" acclamation), but Adam Clayton truly shines on this record, playing with a swagger and confidence not previously highlighted on studio recordings. "Gloria" belongs to him -- his popping bass solo given a new prominence in this new remastered edition. Elsewhere, "Sunday Bloody Sunday" is given a subtle duck-and-punch thanks to his in-and-out basslines that emphasize dramatic moments (particularly in the coda, when the rest of the band wait for his crescendo note before crashing back into the chorus). Overall, this remaster allows a band that has always lived live to fully take flight.